Rosies Roamings - I'm your PA : The virtual assistant company that likes to make you smile. Rosie has had a fun couple of weeks, with Jojo being on holiday she has been with Mummy in the main office, and is always happy to help! They reckon having a dog in the office is a good thing, it might be even better if she could answer the phone or type! Anyone coming to the office is always given a real warm doggy welcome from Rosie, and if you bring treats you will have a friend for life! Often Rosie can be found just cuddled up under Mummy’s desk, however when in the main office she does love to go round and have a cuddle from everyone. This last week Rosie has been learning new tricks like “high five” seen here with Cheryl, but her favourite thing is to wonder up to someone and give them a nudge for a cuddle, she won’t be ignored! In fact the girls refer to her as their comfort blanket! Out of the office Rosie enjoys her weekend walks although now it is getting wet and muddy she hates the baths afterwards! If you have ideas how to get a Cockapoo to walk without getting dirty, please do let her know! I reckon we will need to get her a coat and some wellingtons to get through the winter – she is such a fair-weather walker! 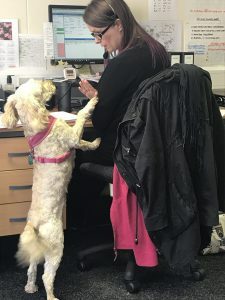 So next time you are in Wolverhampton, why not drop into the office and come and say hello to Rosie, I swear she believes that everyone who comes to the office just comes to see her – it’s never anything to do with work!